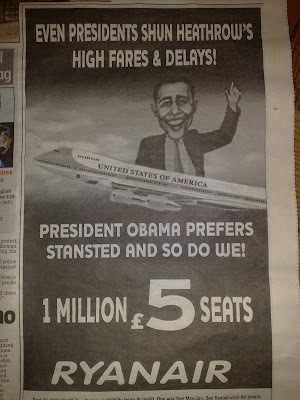 Ryanair - Barack Obama stars in latest Stansted fares promotion! Barack Obama is arriving at Stansted airport tonight for his first visit to the UK and budget airline Ryanair have taken the opportunity to include him in a tactical ad promoting their latest fare offers. Under the slogan 'President Obama prefers Stansted and so do we' Ryanair have cleverly used all the G20 press coverage as a backdrop to their latest seat promotion. Ryanair may have been generating negative headlines with recent advertising and marketing tactics, however this tongue in cheek ad raised a smile on the way home.